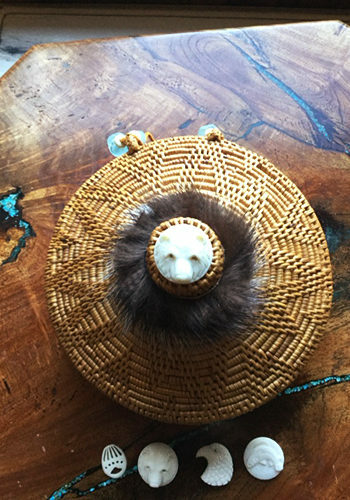 4″x 6″ Oval handwoven grass basket with lid enhanced with carved bone,recycle glass and bone beads. If it is a true piece of art that you are looking for. 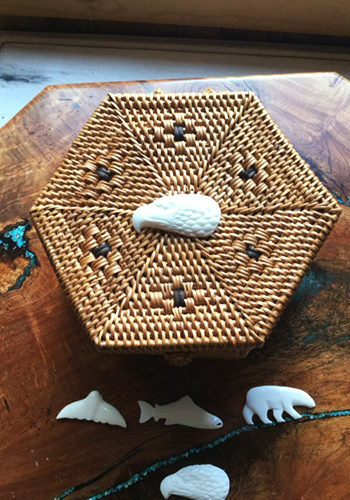 Then look no further than these lovely Handwoven 4″x 6″″ Oval Basket with Carved Bone fetish. First you get to choose from which Carved Bone pendant you would like. 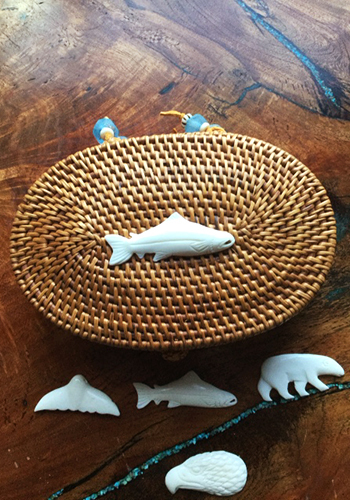 In addition your choices are the Whales tail, Salmon, Walking bear, and Eagle Bone Pendant. The detail in these rustic hand carved bone charms will amaze you. In all honesty you will be amazed by the workmanship that goes into each and every basket. Moreover each piece is beautifully crafted and handwoven from Grass Reeds. Customers will love these handwoven treasures that compliment any space. 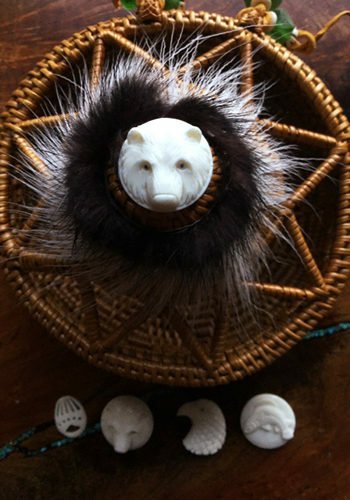 In addition each one is adorned with carved bone pendants that depict symbols of Alaska. 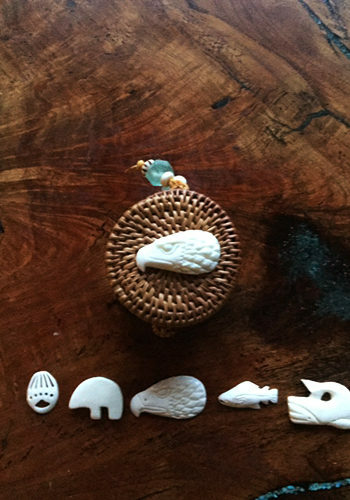 Each carved bone Pendant features a different spirit totem or animal indigenous to Alaska. In addition these Baskets and Vases come in all shapes and sizes. Sizes ranging from round baskets to 6 sided grass baskets. We have delightfully cute little baskets, and beautifully woven large baskets and vases. Therefore customers will most assuredly find a basket or vase to suit their taste. Alaskan Reflections has a wide array of hand woven Grass baskets and grass Vases with lids. Moreover all are woven from real grass fronds, and decorated with carved bone pendants. Some of these hand woven works of art have fur trim, and some have Sea Glass beads for embellishment. Each basket is a truly unique hand woven work of art that will make a wonderful addition to any home. Customers looking to buy Grass Baskets online at wholesale prices have come to the right place. Sign up today for our wholesale program and begin enjoying savings, savings of up to 50% on all of our wonderful products.